Lakes [озера; ozera]. Natural, nonflowing bodies of water that fill depressions on the earth's surface and lack direct exchange with the sea. In Ukraine lakes are numerous but small. The contiguous ethnographic territory of Ukraine contains some 4,000 lakes. 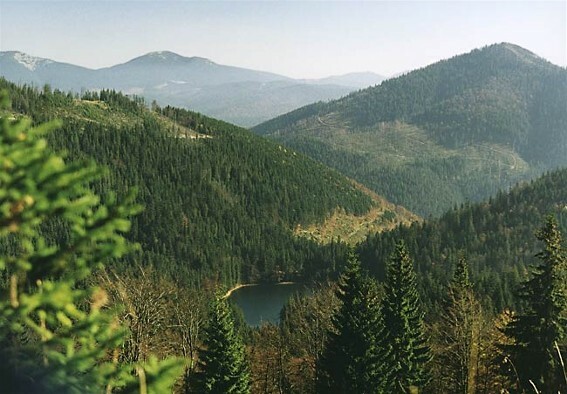 Within the borders of Ukraine there are over 3,000 lakes with a combined surface area of more than 2,000 sq km, which constitutes nearly 3.5 percent of the country's total land area. The mean surface area of the lakes in Ukraine is 0.67 sq km. Only 30 lakes exceed 10 sq km in surface area, and 13 exceed 30 sq km. The majority of lakes in Ukraine are of fluvial origin, commonly associated with the changing shapes and configurations of the river channels in the floodplains of large rivers. Such lakes tend to be small and shallow, are rich in fish, and contain fresh but sometimes muddy water. The largest number of such lakes are found in the floodplains of the Dnipro River, the Kuban River, the Prypiat River, and the Desna River, with smaller numbers along the Dnister River, the Donets River, the Orel River, the Samara River, and other rivers. The construction of the Dnipro Cascade of Hydroelectric Stations resulted in the creation of a system of reservoirs in most of the little lakes of the Dnipro floodplain. Also of fluvial origin are the saline Lake Manych-Gudilo (Manych-Hudylo in Ukrainian; 300 sq km) and other lakes along the Manych River. There are a large number of lakes in western Polisia. They can be divided into several groups. In northwestern Polisia (Brest oblast), notably in the drainage basin of the Yaselda River, there is a grouping of middle-sized lakes—Vyhonivske Lake (surface area, 26.5 sq km; maximum depth, 2.7 m), Chorne Lake (17.2 sq km; 2.2 m), Sporivske Lake (13.2 sq km; 2.1 m)—and a number of smaller ones. Located in swampy terrain, many of those lakes are joined either by slow-flowing streams or by canals, built mostly for the purpose of drainage. Along the upper reaches of the Prypiat River in western Polisia (mostly Volhynia oblast), there are shallow Tur Lake (13.5 sq km; 2.6 m), Orikhove Lake, Volianske Lake, Bile Lake, Liubiazh Lake, Nobel Lake, and other, smaller lakes. Like the lakes along the Yaselda River they are located in the midst of swamps, are often underlain by peat deposits, and thus belong to the dystrophic class. Some of those lakes are of fluvial origin; others are of glacial or even eolian origin, where the drainage was impeded by sand dunes. Another group of lakes, located between the headwaters of the Prypiat River and the Buh River, includes Svytiaz Lake (24.2 sq km; 58.4 m), Pulemet Lake (16.3 sq km; 19.2 m), and other, smaller lakes. Those lakes are deeper, obtain their clear water from springs in chalk formations, and are considered to be of karstic origin. In addition there are small, shallow lakes scattered through southwestern Polisia between the Turiia River and the Styr River and in Volodava Polisia (in southern Podlachia, now part of Poland). 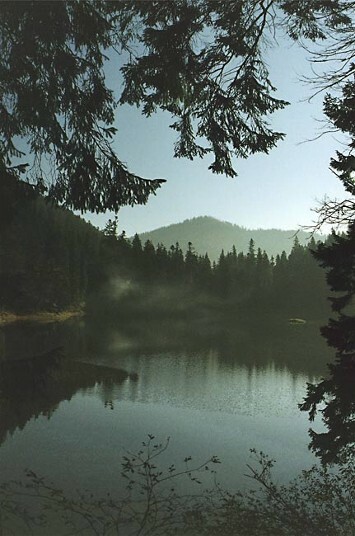 All the lakes of western Polisia have a moderate or below-average level of mineralization. The largest lakes of Ukraine are located along the coasts of the Black Sea and the Sea of Azov. The combined surface area of those lakes makes up nearly 59 percent of the lake area in Ukraine. Some of them are former shallow marine bays (lagoon lakes), and others are enclosed flooded river estuaries (limans). Both are separated from the sea by narrow sandbars. Coastal lakes are large but shallow and have considerable (if not high) levels of salinity. Those with very high mineral content are significant for salt mining and the chemical industry and are use for medicinal purposes. In the southwest the largest coastal lakes also include the freshwater, liman-like lakes blocked off by the levees of the Danube River: Kahul Lake (90 sq km; 6.0 m), Yalpukh Lake (149 sq km; 2.0 m), Katlabukh Lake (68 sq km; 4.0 m), and Kytai Lake (60 sq km; 5.0 m). There are small, fluvial lakes in the floodplain of the Danube as well. Between the mouths of the Danube River and the Dnister River are Sasyk Estuary (also known as Kunduk Lake; 210 sq km; 3.0 m; in the process of being desalted), Shahany Lake (70 sq km; 2.0 m), Alibei Lake (72 sq km; 2.0 m), Burnas Lake (22.6 sq km; 1.9 m), and the Budatskyi Liman (30.0 sq km; 2.0 m). At the mouth of the Dnister River are the Kuchurhan Estuary (20 sq km; 5.0 m) and the Dnister Estuary (360 sq km; 2.5 m). Between the Dnister Estuary and the Dnipro-Boh Estuary are the Khadzhybei Estuary (70 sq km; 13 m), the Kuialnyk Estuary (61 sq km; 3 m), the Tylihul Estuary (150–170 sq km; 21.0 m), and the Berezan Liman (60 sq km; 3.2 m). On the northern coast of the Sea of Azov are Molochne Lake (170 sq km; 9.0 m), and the Miius Liman. Along the Kuban Lowland coast are Lake Khanske, the Hirkyi Liman, the Solodkyi Liman, and many other lakes in the delta of the Kuban River, including the Kirpili Liman, Lake Skeliuvate, the Boikiv Liman, the Ponura Liman, the Skhidnii Liman, the Kurchanskyi Liman, the Akhtanyzovskyi Liman, the Tsokur Liman, the Kyzyltashskyi Liman, and the Vytiazivskyi Liman. Those numerous shallow (1 to 1.5 m) lakes are rich in fish life and occupy a combined surface area of 1,360 sq km. 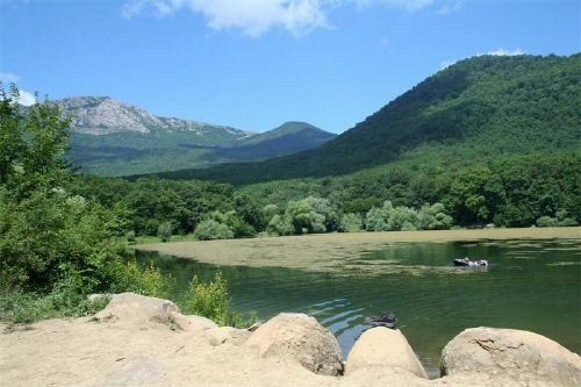 In the Crimea there are shallow, salty lakes south of the Perekop Isthmus (see Perekop lakes), including Chervone Lake (Krasne; 34 sq km; 1.0 m), Kyiatske Lake (12.5 sq km; 0.4 m), Kyrleutske Lake (20.8 sq km; 0.6 m), and Aihulske Lake (37.5 sq km; 0.3 m), probably outlying remnants of the shallow Syvash Lake. Other coastal lakes in the Crimea include Donuzlav Lake (48 sq km; 27 m), Sasyk Lake (75 sq km; 1.2 m), and Saky Lake (8.1 sq km; 1.5 m) on the west side, and Aktashske Lake (27 sq km; 0.1 m), Chokratske Lake (8.5 sq km; 0.8 m), Tobechytske Lake (19 sq km; 0.5 m), and Uzunlarske Lake (21.1 sq km; 0.1 m) on the Kerch Peninsula. Besides those in western Polisia and the coastal zone and along the floodplains, there are few lakes of appreciable size in Ukraine. There are karstic lakes in southwestern Polisia (formed as a result of the erosion of chalk), in Podilia and Pokutia (the erosion of gypsum), in the mountains and foothills of the Crimea (the erosion of limestone), and in the Donbas near Slovianske (the erosion of salt). To the karstic lakes may also be added the seasonal lakes, which occupy pody (depressions formed as a result of the compaction of waterlogged loess) in the spring. 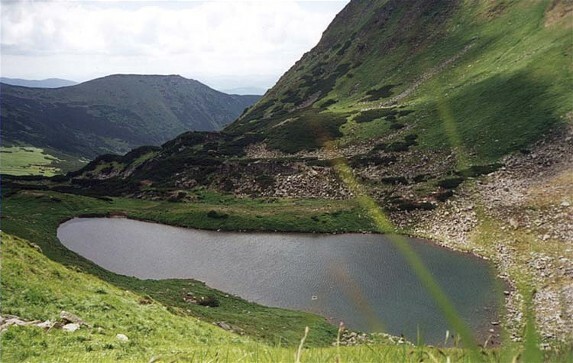 The few lakes in the Carpathian Mountains have a variety of origins, including tectonic, postglacial (notably the tarns of the Chornohora Mountains), and volcanic (such as the Morske Oko in the Vihorlat Mountains) origins. All those lakes are small (the largest being Synevyr Lake) and contain clear, fresh water. 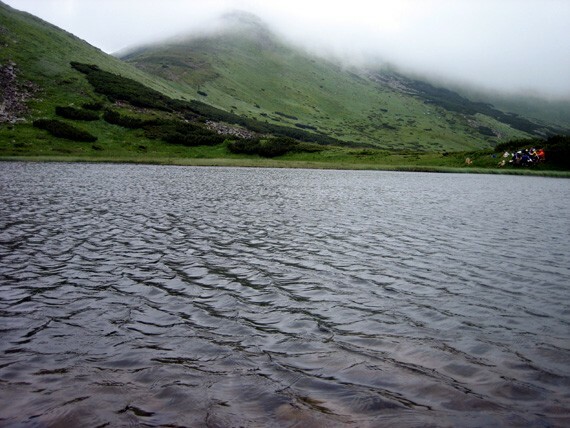 Lakes found in the Caucasus Mountains are of similar origin and have similar characteristics. In addition to natural lakes there are many artificial ponds (about 18,000) and water reservoirs in Ukraine. The six large reservoirs on the Dnipro River alone occupy a combined surface area of over 7,000 sq km. The combined area for all ponds and reservoirs in Ukraine (January 1986) is 11,730 sq km; they retain 57.8 cu km of water.